Using the information in this article will allow you to create a variety of different flows in your AdvocateHub. These flows will give you the ability to automatically serve up challenges for Advocates during specific points in their lifecycle based on date fields on the Contact or Account objects in Salesforce. This will take a huge amount of the burden off of an Administrator. In Salesforce, we are going to manipulate a date field you have set up by creating a new formula field which will display a range of the number of days since the date specified in the date field you are targeting. For example, if you have a Salesforce date field on the Account or Contact called 'Launch Date' and the value of this field is January 1st 2019. We will use the formula field to count how many days in the past this date was compared to the present day and then to visualize this by a range of numbers. Working with this example, if the current date is January 20th the range could show a range of 1-20, as in, the date in the Launch Date field happened 1-20 days ago. We will discuss how to set this up in more detail below and display how flexible this can be. The value of this field can then be mapped to the Advocate's profile in the form of a match category and this data can then be used in the targeting of Challenges so that the Advocate can have a challenge(s) unlocked automatically based on how long ago they launched. Let's start by creating our new 'date range' field on our Contact or Account object where our target Date Field lives. For these steps, I will be working with a field called "Launch Date" on the Account object. 3. 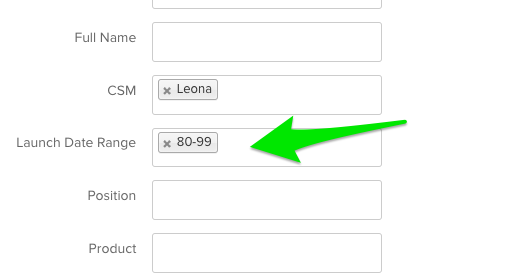 On the next page, label the field however you like and choose "Text" as the Formula Return Type. I am going to name it "Launch Date Range" in this example. But what if we want rolling ranges? The formula below builds on the one above and will now populate our field with 0-19 if the Launch Date is within 20 days, 20-39 between 20 and 40 days, 40-59 between 40 and 60 days and "None" if the date falls outside these ranges. You should be able to see the pattern now. If the field you were working with was called "Renewal Date" then you would replace any occurrence of "Launch_Date__c" in this formula with "Renewal_Date__c". Now that we are all set on the Salesforce side we can jump back into your AdvocateHub to complete the flow setup! 2. Now we need to map the Salesforce date range field to our newly created match category! Go to your Salesforce integration in your AdvocateHub and under the Settings tab, expand the Automatic Customer Data Import section.